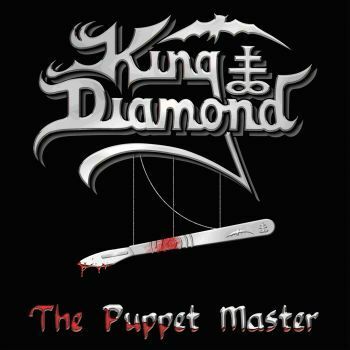 KING DIAMOND - THE PUPPET MASTER 10TH ANNIV. VINYL (2LP) | Online Shop | Wizard LTD. Album: "THE PUPPET MASTER 10TH ANNIV. VINYL (2LP)"
The Puppet Master is KING DIAMOND’s 11th album and has been released in 2003. It is a concept album with a storyline telling the tale of a young couple who go to watch a puppet show in Budapest in the 1700s, and end up being turned into undead puppets by the Puppet Master and his wife. KING DIAMOND once started off with his band BLACK ROSE in 1979 and joined BRATS incl. Hank Sherman and Michael Denner in 1981. They all founded legendary MERCYFUL FATE back in 1983 and ever since he was pretty much part of the underground heavy metal scene. He became quite successful and the scene accepted him though. His trademarks, dramatic lyrics, his theatrics, his person itself, all combined with powerful and melancholy music, were still given when he started his solo career as just KING DIAMOND. KING brought new ideas and never heard before elements to Heavy Metal like nobody else. With his preference for Horror Movies which made it into his music he broke new ground and made the scene experience a refreshing breeze and led the KING to the very top of the metal world. He not only influenced bands such as Metallica, Megadeth and Slayer. He is also known to be the main inspiration for the entire metal movement! Etched side D and poster.